John Lacques has devoted his professional life to using music as a tool for empowerment and transformation. 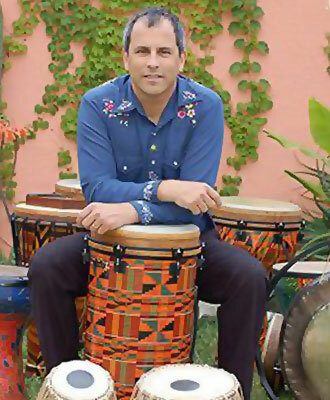 With Drumtime, John combines his unique talents and expertise as an educator, professional drummer and theater artist, to facilitate drum circles that encourage and support others to become creators—not just of music, but creators of joy, health, success and community. Through Drumtime, John offers drum circles customized to service the needs and goals of businesses, organizations and institutions. He has also developed and implemented a number of programs for youth, including circles for incarcerated youth and at-risk teens as well as after-school and conflict resolution programs. He also creates rhythm circles for adults and children with special needs. John has facilitated hundreds of drum circles. From corporate events, trainings and team building, to large public festivals, retreats and conferences, he brings to each circle an energetic, responsive and nurturing method of leading. His standards of musical excellence ensure that participants experience the thrill of making truly good music together, literally transforming play into achievement. As a facilitator, John is trained and certified by Arthur Hull’s Village Music Circle, as well as certified in Remo Health Rhythms training. He is proud to be an official Endorsed Facilitator for Remo Drums and a member of the Drum Circle Facilitators Guild as well as a long time Paiste Cymbals endorsee. John has worked for thirty years as a drummer and percussionist, both as a session and touring artist while continuing to be a fixture on the Los Angeles music scene. Musical styles include jazz, rock, pop, country and kirtan. John plays drum set and numerous other percussion instruments including congas, djembe, cajon, and Indian Tabla, which he studied intensively both in Los Angeles and in India, with such notable masters as Abhiman Kausal, Ram Krisna Bose, and Hari Har Rao. John has studied drum set with Jeff Hamilton, Casey Scheurell, Murry Spivak, and Fred Gruber. John’s work as an actor in the theater ran the gamut from drama, including a Dramalogue Awards for his role in the play, Close, to experimental theater, to touring children’s plays throughout California. John trained extensively in a number of disciplines—notably in Meyerhold’s Biomechanics with Genadi Bogdanov, Black Mask with Mario Zapien, Commedia dell’arte with Paul Verdier and Suzuki and Viewpoints training with the Siti Company. He also worked as a composer and as a one-person on-stage improvisational orchestra for a number of well-known theater companies, including Zoo District and the Fabulous Monsters.